Thirty-one-year-old Carolyn Lapp has never been married-but she’s been a mother for fifteen years. In a community with strict standards and a long memory, Carolyn knows she might never find a man who will have her and her son, Benjamin. Carolyn’s family tries to marry her off to a widower with a daughter who needs a mother. A marriage of convenience doesn’t sound so bad, yet despite her loneliness, Carolyn knows what she really wants: a traditional Amish family and a marriage for love. When Benjamin gets into trouble at an auction, he finds himself beholden to a handsome horse breeder named Joshua Glick. Joshua and Carolyn feel an instant attraction, and soon a romance is budding between them. The trouble is Joshua believes Benjamin is Carolyn’s nephew, not her son. After years of shame and loneliness, Carolyn suddenly has two men vying for her attention. Can either man give her the family-and the unconditional love-she longs for? Or will her past once again sabotage the future she wants? 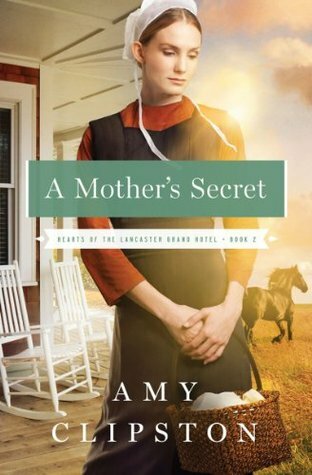 A Mother’s Secret by Amy Clipston is exactly that. A young Amish woman loved a man who didn’t love her back. He wanted to leave and she stayed behind. She soon found out she was pregnant. And since then, she has been punished by many including those in her own Amish community. But most of all she has been punishing herself the most. Caroyln Lapp found herself always feeling defensives. She hides that secret that Ben is her son. Mostly everyone knows but only a few haven’t known. And one of them includes a man that has won her heart. Carolyn knows she needs to come forward but is afraid of being not liked and judged once again. She and Joshua have just become real friends and she’s scared he will push her away. When the time comes, it surprised me what one character did and said. That one character made all the difference. I cried so hard. How adult like and mature that character was in that moment. Amy Clipston has shown what the true meaning of forgiveness is both from oneself and from family. It was a hard journey and took the characters a bit of time before they could come to terms with their behavior. Meanwhile, the leading protagonist blamed herself repeatedly. But due to forgiveness by others, support from her mom, and a second chance at love, Carolyn may just find forgiveness for herself. Overall, A Mother’s Secret was a beautifully told story. It shows how far a mother would go to protect her son. And how far that son would go to defend his mother. The love of a mother is one that shouldn’t be put lightly. Amy captured the realistic moments of being a mother and how hard it can be to move forward from mistakes. Plus, the story truly highlights what real Christianity is and isn’t. I highly recommend this Christian tale to all.